Everyone at some point struggled or struggles with simple math in school. NumRush is a fun and challenging math game that will help instill those core concepts all while providing a fun platform to do them. Similar to Scrabble, players need to place their tiles in orders that match the number on the die by using either addition, subtraction, division or multiplication. The infinity game board keeps the score. With fun illustrations, NumRush is a great game for all levels of math skill and allows older players or even parents, to play with younger players. The official rules are easy to learn how to play and can be adjusted for your circumstances. Learn more about NumRush below and give it a try today. Review Completed (2017-11-12) Math can be a hard thing to learn and is a learning concept that you can never practice too much. That is why we were excited to see an educational math game that looked so fun. What we really like after playing is that you can customize the gaming experience based on who you are playing with or what math concept you want to practice. One game you can force everyone to add while the next you must subtract. You can also play turn by turn for a slower pace game or have a mad rush of cards in a free for all game. NumRush is a game that is heavily based off of the Scrabble concept – laying cards down in a grid to form the number on the die. It is simple and easy to learn how to play. Advertised as an ages 8+ game, the illustrations and basic rules allow for children to pick this game up quickly and have fun at it. We initially played with our cards in our hands (poker style) and had a hard time seeing our numbers since they are all centered and not in the corners like most decks. Then we realized that it is much easier for everyone if we laid our cards down in front of us since there is really no advantage to keeping your cards secret. We liked how the numbers were big and the scoring of each play was simple to understand – one point for every card in your row and two points for star cards. The game that we received to review was a complete prototype so we can’t say much about the future quality of the game but we can tell by the effort put into designing the game that it will be acceptable. The size of all the components works well. The rules are still being designed at the time of the review and we expect them to be of equal quality. We really enjoyed playing NumRush and like the education value it has. Playing with the whole family you can get quite a fun grid going on the table that will be sure to challenge everyone. With the ability to adapt or challenge everyone in different ways, this game has a lot of possibilities. 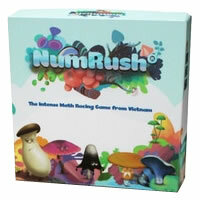 We would recommend NumRush as a great family game for elementary aged children. Whoever can get all the way around the game board first wins. 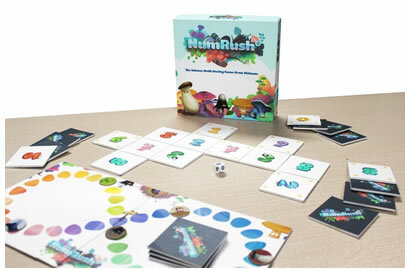 You should get 1 game board, 60 number cards, 6 tokens, 2 dice and the official NumRush game rules and instructions. Please keep in mind that the official NumRush board game rules and instructions could be different depending on the game version you have. 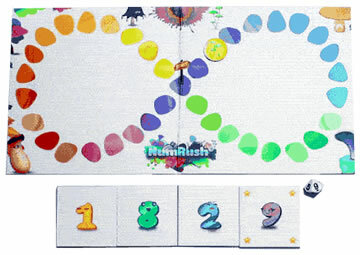 The rules below are some of the exact directions on how to play NumRush. Share with us your comments, funny stories, tips, advice, strategies, creative ways to play, questions about how to play, problems with the rules or anything you want about NumRush. All submissions will be reviewed within 24 hours. Click here to add your NumRush comments.